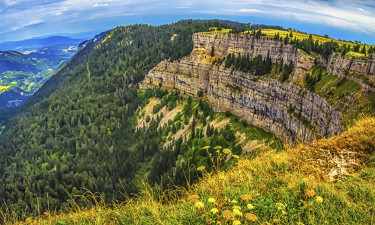 Jura and the Alps is one France's most stunning natural regions. The area is dotted with imposing mountains, waterfalls, lakes, and picturesque villages that set a relaxing tone for an unforgettable camping holiday with a luxury touch. Find out more or book you luxury camping break with Lux-Camp. Located in a peaceful corner in northern France, Jura and the Alps is the perfect place to discover the best of rural life. The area is home to several UNESCO Heritage Sites, like the Besancon citadel and the medieval town of Arc-en-Senans. Jura and the Alps is a top choice for anyone looking to combine a relaxing camping holiday with sightseeing and cultural activities. Why should you camp in Jura and the Alps? Le Val de Bonnal is surrounded by lush forests and pristine lakes, Le Val De Bonnal offers premium accommodation in cabins, mobile homes, and eco-lodges. The campsite has an on-site waterpark and the surrounding area offers plenty of opportunities to go cycling, fishing, and canoeing. Camping Le Fayolan is luxury camping in a unique natural environment at Le Fayolan, located within easy reach of two alpine lakes and Haut Jura Natural Park. Accommodation options include luxurious bungalow tents, 1, 2 and 3-bedroom cottages, and furnished luxury tents that can accommodate 5 people. 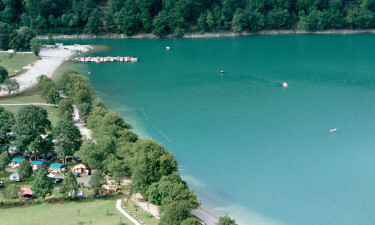 Les Fontaines is a luxury camping site with a privileged location between Lake Annecy and the magnificent Alps. Guests can choose to stay in wooden chalets that can accommodate 2-6 people or in luxury mobile homes that are every bit as good as a holiday apartment. Water aerobics, tennis tournaments, archery lessons and a traditional bar and restaurant will keep guests of all ages entertained. Jura and the Alps has some superb hiking and scenic mountain roads where you can see as far as Switzerland. The region is known for its unspoilt nature and breathtaking beauty. There are also several lake and riverside beaches all over the region. Relax and unwind at the hot springs in Divon-les-Bains or Luxeuil-les-Bains. If you are here on a family holiday, take the kids to the Toy Museum or follow the dinosaur tracks in Loulle. Other attractions include the local mountain villages and the medieval castles at Chateau d'Arlay or Frontenay. 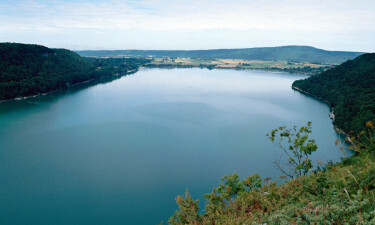 Jura is known in France and beyond for its gourmet foods and top-class wines. The sublime Bleu de Gex, Morbier, and Juraflore Comte cheeses can be paired to perfection with the best local wines, such as Vin Jaune, Poulsard, and Savagnin. The cultural events calendar is marked by the medieval festival in Peruges, the Esplanade de Luc music and theatre festival, and the Haut-Jura classical music festival.